This week we have something slightly different and very special for you. We asked one of our composers, Thijs Kammer, to write a music-related post. Below, he goessuper in-depth on how he created a specific sound sample for one of Roche Fusion's boss-fight themes. I hope you enjoy the read, and listening to the samples! "Birth of a Monster" is one of the tracks used for the big boss fights in Roche Fusion and has a dark, brutal and epic atmosphere. The composition is based on an ostinato bass motif and a repetitive pattern played by the taiko drums. The taiko drums are heavily processed to enforce the dark and threatening feel of the boss fight. Big reverbs are used to create the epicness. Let's take a look at the effects applied to them! 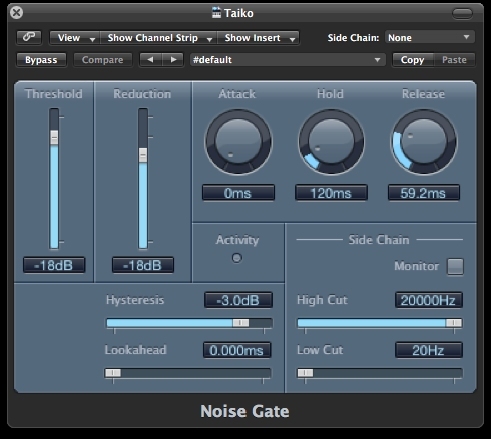 The taiko drums samples had a lot of typical concert hall reverb on them. This particular concert hall reverb wasn't going to work in the context of the track, neither I wanted to process the sounds heavily with the reverb on them. So I decided to get rid of the original reverb as much as possible. To get rid of the tail of the reverb sound I tried to isolate the beater sound with Logic's gate. Since the taiko sounds were very dynamic I wasn't able to set the gate right. Some reverb tails were passing the gate and with more rigorous settings the sound of the beater started to disappear. Logic gate to catch the beater. In example 2 you can clearly hear the reverb tails slipping through the gate. 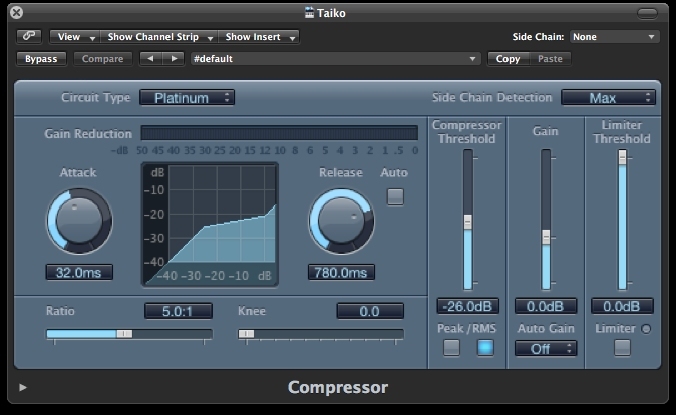 I decided to smooth out the dynamics of the taiko drums with Logic's compressor to have a clearer beater sound with less dynamics, example 3. With the compressor on, the gate was better able to pick up the exact peaks in the taiko drums so that only the beater sound could pass the gate and the tail was silenced. After experimenting I found the settings that worked best. When comparing the taiko with and without the compression you hear a big difference in character. The compression helped the gate to focus on the transients. Notice that the compressor has a long attack time of 32 ms and a long release time of 780 ms to emphasize the sound of the beater. It's interesting that in this case both effects need to be applied in a mutual way to get the intended result. Fatten up the sound - adding a Decapitator and a bitcrusher. 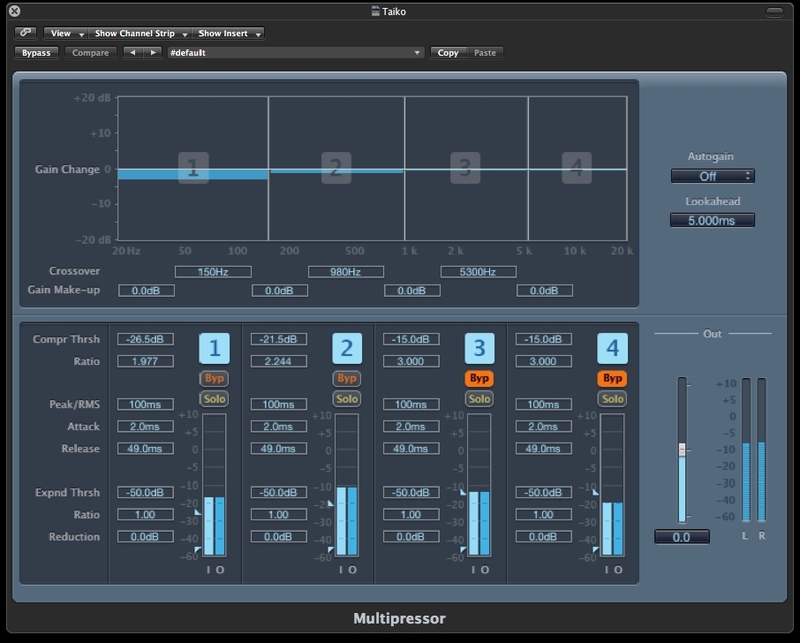 To fatten up the sound and make it a bit grittier Soundtoys’ Decapitator and Logic's bitcrusher were applied. They both made the taiko drums sound more aggressive. Also it made the taiko drums sound less natural so that it matched better with the other synthetic sounds. ThumpyBumpy was this preset called...I might have tweaked it a bit. 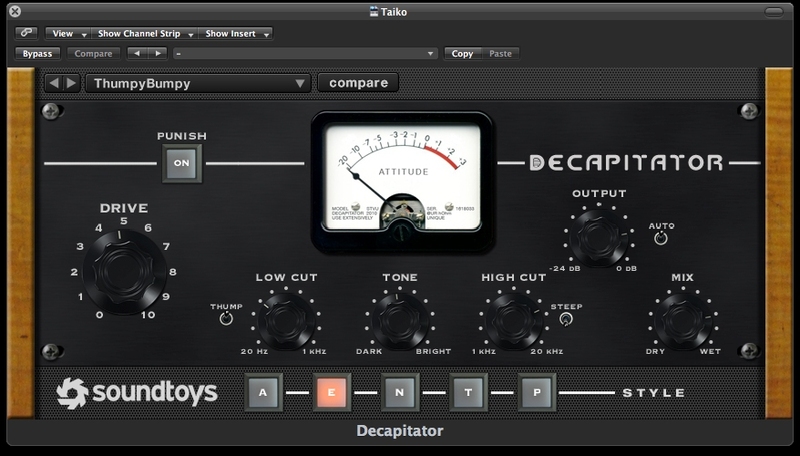 Notice how the low mids sounds much thicker with the decapitator on. The bitcrusher is set very gentle. 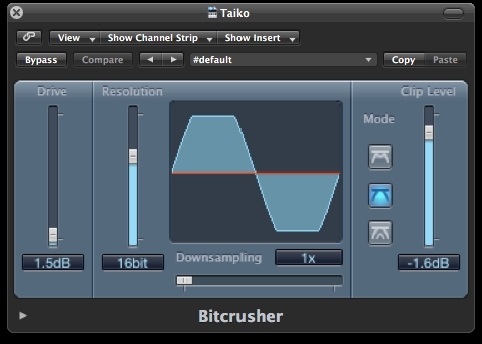 Example 6 - Taiko drums, Decapitator and bitcrusher on. With the bitcrusher on, you hear a crispy fire-like sound in the tail of the beats. A side chain compressor activated by the kick was added to carve out a bit of space (for the kick's attack). The compressor was working with a gain reduction of 2 db. After experimentation a release time of 460 ms gave the best results. Obvious that's a very long release time in this case but I guess it had to do with other settings of the compressor that made it necessary. 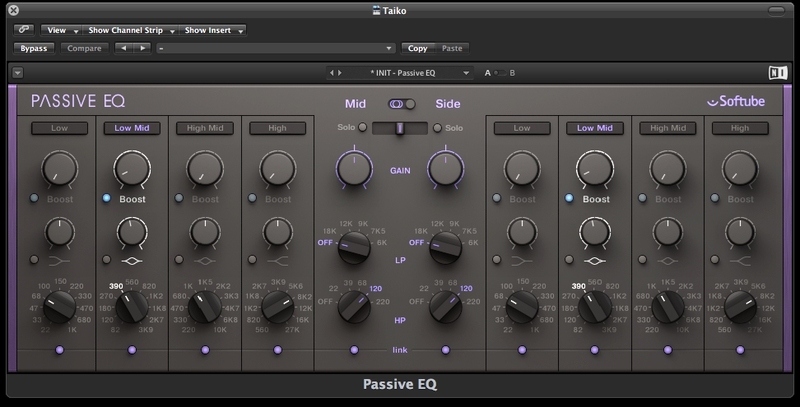 A Softube's Passive Eq was used for a small bump at 390 hz to emphasize the body of the taiko drums. In the mix I wanted to leave the low end for the bass and kick so I decided to add a high pass filter at 120 hz. Normally I put this filter earlier in the chain but in this case I wanted to make sure that the decapitator and bitcrusher worked on the full spectrum of the sound instead of a smaller part. Notice that the eq decisions were made later on in the mixing process in the full context of the mix and with all the effects on. By itself I like the taiko better with a lot of bass on them! The ringshifter of Logic was used to get the defining out-of-space sound from the taiko drums, the "breathing" noises of the ringshifter also enforce the feeling of a big monster nearby. I love that sound! 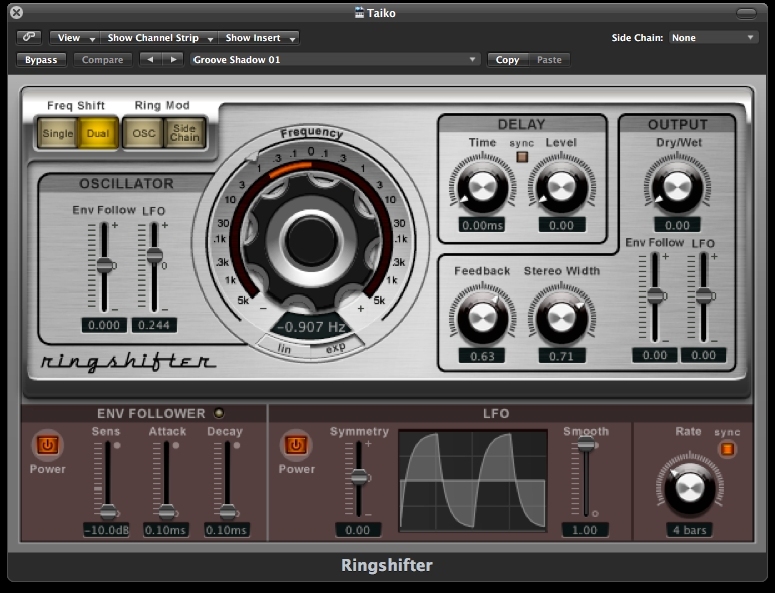 A side-effect of the ringshifter was that it made new sub frequencies. To make sure those weren't overloading the low end, a new high pass filter was applied at 49 hz. To tame some more peaks of the lows the multipressor of Logic was applied. 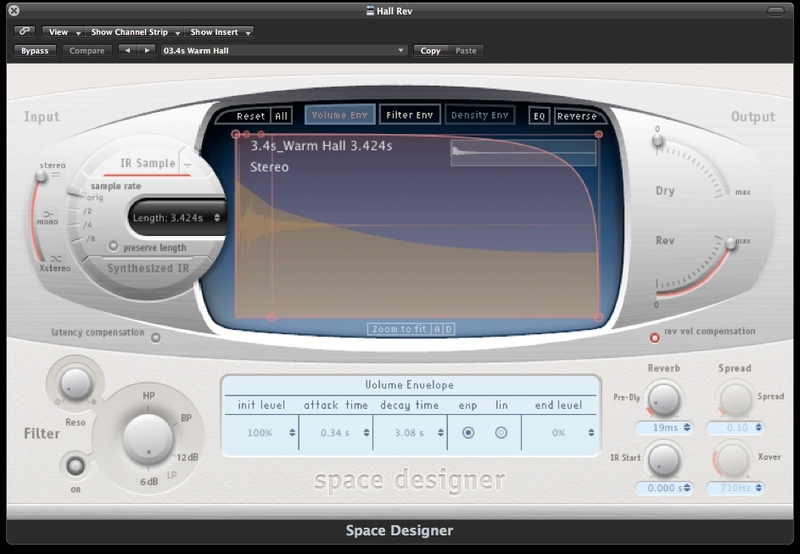 The signal was send to a reverb channel with Logic's space designer with the warm vocal hall-preset, also some more eq to cut away more lows. This added back the tail to the sound which was lost in the first steps of our processing. Logic's Space Designer was used to make the epic reverb sound! After applying all the effects I used automation to change the sonic character of the taiko drums during the song. The wet/dry signal of the ringshifter is automated, as are the frequencies of the high and low pass filters. Both effects generate momentum and excitement in the track and steer the attention of the listener to certain points in the song. I like to compare different option. Adding up all the effects together made a big impact on the sonic character of the taiko drums. With so many effects on one channel it can be difficult to keep the overview. In this case all the effects had a clear reason to be placed in the signal chain so there's no reason to be scared about that! I hoped you liked this article, and if you're interested in more please let me know.